They were picnicking in Pierre, having fun at Frankfort and raising a racket at Redfield. So wrote a newspaper headline writer in describing efforts to select a new location for the capital of Dakota Territory. When the territorial legislature met in 1883, a bill was introduced to locate the capital in Huron rather than Yankton, which had served as capital since 1862. This opened the door for other communities to send representatives to Yankton to present their case for being the capital. A nine-member commission was appointed to locate the site of a new capital. Of the nine commission members, five were from the southern part of the territory, one member was from the Black Hills area and three were from the northern part of the territory. The commission was to meet in Yankton and organize by electing officers. It was to select by at least a majority vote a suitable site for a capital based on its accessibility from all portions of the territory and its general fitness for a capital. Towns had to guarantee $100,000 cash and 160 acres of land in order to be considered. Yankton residents were unwilling to give up their town being the seat of government without a fight. Commissioners were aware that an attempt would be made in Yankton to prevent the commission from organizing. They boarded a train furnished by the Milwaukee Road in Sioux City, Iowa, and started for Yankton sometime after midnight on April 3, 1883. “The speed was so timed that we arrived at Yankton just as the sun was rising … It is needless to say that the sheriff had no opportunity to board the train and serve papers, if he had any. As the train left Yankton, one long blast of the whistle of our locomotive was sounded. This was the first intimation the people of Yankton had of our visit,” commission member Burleigh Spaulding (also known as Spalding) wrote in a series of newspaper articles published in 1932. As this “Capital on Wheels” passed through Yankton, the commission elected officers and moved to receive proposals from towns interested in becoming the capital. Bids were received from Mitchell, Canton, Ordway, Aberdeen, Redfield, Frankfort, Pierre and Huron in what is now South Dakota and from Steele, Bismarck and Odessa in what is now North Dakota, according to state historian Doane Robinson. Traveling by train, the commission visited each town that hoped to be named the territory’s capital. At Pierre, the commission was greeted by the music played by the military band from Fort Sully. 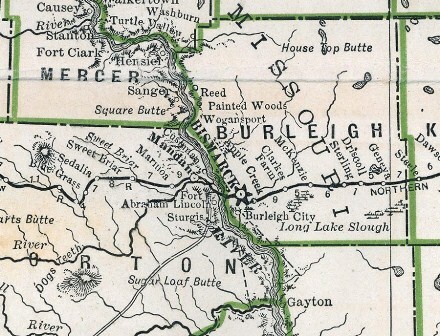 “Pierre is a unique town, larger in her mind and in her hopes than in reality, but really having a glorious future, capital or no capital,” the newspaper correspondent wrote. The last town visited was Bismarck. “I was candid in saying that Ordway possessed an exceptionally beautiful site. I was earnest when I pictured the advantages of Pierre’s location but after driving to the top of Bismarck’s capitoline hill, and to the entrancing strains of the Fort Keogh military band, drinking in the beauties which were visible in every direction my hat comes off,” the correspondent wrote. The commission agreed to meet on June 1, 1883, to select the new capital. It wasn’t until the 13th ballot that Bismarck received five votes – enough for a majority. McKenzie, a member of the commission, was the sheriff of Burleigh County and the political agent of the Northern Pacific Railroad. Many believed that territorial Gov. Nehemiah Ordway also played a role in locating the capital in Bismarck. Those who believed the commission was illegal brought a court case that went all the way to the United States Supreme Court. The matter was never settled, however, because statehood was granted before a decision was made. The cornerstone for the new territorial capital was laid on September 1883. Bismarck’s time as territorial capital was short-lived, however. Statehood was granted to North Dakota and South Dakota on Nov. 2, 1889. Instead of the fight being for the territorial capital, the stage was set for a state capital site battle.